In the late spring of 2012, I had the wonderful opportunity of attending an annual international conference held in New Orleans, Louisiana. The International Particle Accelerator Conference (IPAC) was established in 2010 to join together the world’s largest organizations working on topics pertaining to particle accelerator technologies and applications. Among them includes CERN, Department of Defense, Department of Energy, IEEE, and countless national laboratories, physical societies, and accelerator facilities around the globe. Conference poster for the 3rd annual International Particle Accelerator Conference held in New Orleans, LA, USA. It was here that I was given the opportunity to showcase my research as well as get acquainted to the research of fellow scientists in the field. There were over 2000 participants in all. I ran into old professors and advisers, friends, and colleagues I met along the journey. I presented on the compact radio frequency accelerating structure that I built at the Center for Exploration of Energy and Matter (message me if you are interested in reading the paper). To the best of my knowledge, it the the most compact accelerating structure of its kind in current literature. Overall is the wonderful, humbling, and empowering experience for a young scholar. On the flight back to Indiana, still buzzing with excitement, all I can think of how I can keep pushing and contribute further to the accelerator physics community. I hope you’ll one day get to experience the same. The Ernest N. Morial Conference Center setting up for IPAC 2012. Photo by Victor G. Ramirez. Both researchers and vendors prepare their booths for IPAC 2012. Photo by Victor G. Ramirez. The conference’s opening ceremony. Somewhere in the crowd I am sitting, absorbing the experience. Photo by Victor G. Ramirez. The conference included both oral presentations and poster sessions. Photo by Victor G. Ramirez. There is a coffee break between every scheduled session. This is where we grab a pick-me-up and chat. Photo by Victor G. Ramirez. The billboards to the left are for research posters that rotates between specialized topics for every given day. Researchers, including myself, typically stand by their poster to answer questions. All conference proceedings must be be accompanied by a journal quality 3-page report. Photo by Victor G. Ramirez. All the big vendors like Agilent and Tektronix were there to showcase their latest and greatest gadgets. Photo by Victor G. Ramirez. In copper, a beautifully machined radio frequency quadrupole structure. And in Niobium, encased in glass, sits a superconducting radio frequency structure. Photo by Alfonse N. Pham. It is conference tradition to pass on the ceremonial bell to each successive conference chair. The chairperson for this year’s conference is Victor Suller, the associate director of the CAMD facility at LSU. Photo by Victor G. Ramirez. Victor would chime the bell giving the participants a 5-minute warning that the next session is about to commence. It was hilariously like herding cows. Photo by Victor G. Ramirez. “Networking” with some fellow colleagues on Bourbon St. Photo by Alfonse N. Pham. And oh, did I mention seafood? Cajan spiced deep-fried oysters with blue cheese. Photo by Cara S. Maffini. Seafood! Soft-shell crab eggs benedict. Photo by Alfonse N. Pham. No NOLA trip is complete without a visit to the Cafe Du Monde. Photo by Alfonse N. Pham. Iced coffee and sugar-coated beignets. Photo by Alfonse N. Pham. End of the semester… already? Time has really flown by this semester. It seems like it was just a few weeks ago that winter break was over and the ground was covered in snow. Now we are getting bombarded with April showers, and getting (almost) beautiful spring weather (the reason I say almost is because it is currently 40 degrees outside, which is a little bit annoying). Because I am no longer taking courses, the end of the semester has taken me by surprise. The only real end-of-semester responsibilities that I have is making sure that my students (three research assistants that are receiving credit for helping me with my research, and a senior honors thesis student) end their semester well. I actually very much enjoy mentoring undergraduates, especially in something that I love to do. Its really good to see how they have grown (and how much I have helped them grow) during the past year that we have worked together. I also like to think that the experience they received by working in the lab) will stick with them through their professional careers, whatever those may be. So I think for this semester, the actual hard part about wrapping up will be preparing for a productive summer!! Today my sons and I attended our first “Little Five” race in Bloomington and I loved it! Although it was freezing I still enjoyed watching the cyclists power around the field in what seemed to be a never-ending endurance race. The Little 500 (also known popularly as the “Little Five”), is a bicycle race held annually at Bill Armstrong Stadium on the campus of Indiana University in Bloomington, Indiana. The race was founded in 1951 by Howdy Wilcox Jr., Executive Director of the Indiana University Student Foundation, who modeled the race after the Indianapolis 500, which his father had participated in and won in 1919. Racers compete in teams of four, racing relay-style for 200 laps (50 miles) along a quarter-mile (440 yards) cinder track. Thirty-three teams are selected in qualifications trials to compete in the main race. Money raised by the event goes towards a scholarship fund for working IU students. Little Five is a unique part of Indiana’s history, as the events surrounding the race “were dramatized in the 1979 Academy Award-winning movie Breaking Away, which depicts a group of Bloomington townies who enter the race as the “Cutters” (from the local Indiana limestone stonecutters) to defeat the favored fraternity team” (http://en.wikipedia.org/wiki/Little_500). Spring in Bloomington is simply gorgeous! I went for a walk the other day and just snapped some pictures along the way. Things are getting pretty busy these days. I am attending the American Educational Research Association (AERA) convention in New Orleans this weekend with one of my faculty members. We are presenting two sessions. The first paper examines how students of color perceive diversity at a predominantly White institution and the other explores how students create and maintain interpersonal relationships in college. These projects coincide with my research interests which examines student development in higher education. After I get back from the AERA conference, I plan to wrap up some projects at my assistantship, grade final papers, and work on final papers. Although these next few weeks are busy, I will find time to enjoy the weather. Bloomington is a nice place to visit in the spring and summer and I look forward to enjoying the city more once things slow down over the next few weeks. My first year as a PhD student, I took some time off for spring break and flew home for 10 days. Although, it was great to see some family and friends, it turned out to be a pretty bad idea. Not only, did I accumulate a ridiculous amount of work, (it took me about a month to catch up and get back on track), but I also manage to upset the rest of the people I did not have time to visit. I learned that, I much rather go home once a year for 3 weeks rather than going twice for 1-2 weeks each. On the other hand, this year, I decided to treat spring break like any other week. Besides, the nuisance of planning around the campus shuttle reduced time schedule, spring break turn out to be much more productive than I expected and way more productive than any other week. Looking back and contrasting my experience with Ishani’s post “Spring break and the planning fallacy”, it seems that what made my experience such a pleasant success was the fact that my expectations, although very ambitious, were not completely out of reach, I just put together the workload I expect to accomplish on a typical 2-3 week period into one week. I will definitely be repeating this approach next year!! Apropos of my previous post, here’s a video of one of best things I did over the break. These are some of the super cool Pueblo dwellings at the Bandelier monument in the Sangre de Cristo mountains of northern New Mexico. Those ladders are easy enough to get up but harder to come down! It’s a fabulously preserved piece of Native American cultural history and a wonderful site to explore. During my first two years as a PhD student, I didn’t really take time off for spring break. But this year, since I plan to keep my nose to grindstone over the summer, I decided to put my research down and let loose for a few days. I called up my best friend and convinced her to go on a road trip with me — destination unknown! So we loaded up a rental car and hit the road. I picked her up from Ohio and decided that driving west back the way I came would be a little boring, so we headed south at first. We stopped in Nashville, TN to see the replica Parthenon and then pressed on to Atlanta and the largest aquarium in the world (both well worth seeing, by the way). From there we drove to Pensacola, FL and then along the Gulf coast to Galveston Bay. After a lovely day on the coast in the sun, we went to check out San Antonio (as a historian, I insisted we stop to see the Alamo, of course) and then drove the entire breadth of Texas on a epic quest to encounter my friend’s first tumbleweed. After a brief stop in Roswell (in the middle of the night! ), we pressed on to Sante Fe and hiked the Frijoles canyon at Bandelier National Park. With time running out, we turned back toward home and followed Route 66 for about a thousand miles, stopping at the famed Cadillac Ranch in Amarillo on the way. All told, we clocked 4600 miles in 7 days, crossed 17 states and had an absolute blast. Now it’s back to the books, but I feel refreshed and ready to tackle these last few weeks. It was definitely a break to remember! 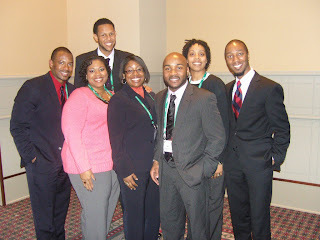 Similar to Tomika, I attended the National Association of Student Personnel Administrators conference in Philadelphia during Spring Break. As a member of the preconference committee, I was responsible for selecting programs for this portion of the convention. I attended a session by Dr. Frank Harris and Dr. Shaun Harper examining issues facing college men. This session coincided with one of my research areas which examine the social construction of masculinity and male identity development. A few days later, I presented a session with colleagues from Bowling Green State University, University of Michigan, University of Georgia examining the experiences of Black doctoral students at predominantly White institutions. Approximately 80 people attended the session. At the conclusion of the conference, I spent a few days in New Jersey and New York before heading back to Indiana.